All that looks beautiful is not noble. All that looks ugly is not evil. But we have little sympathy for the creatures that don’t look good to us – be it snakes or crocodiles. Of the three kinds of crocodiles found in our country, there is only one kind found in Udaipur. Crocodile is a cold-blooded reptile but it does not hibernate in winters. Nature has made it so. It lies with its mouth wide open basking in the sunlight during the cold months. The insides of its mouth are like a solar battery. In the daytime it absorbs heat and at night, when the temperature starts going down, it keeps itself warm by making use of the storage of heat to maintain its body temperature. 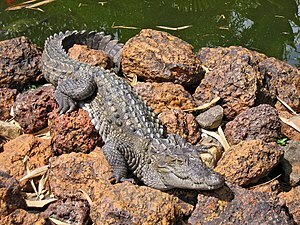 In the lakes in and around Udaipur, crocodiles were found in abundance in the 1950s. It was an ordinary sight to see 20-30 crocodiles in one pond, especially in the small pools of Banas River. But when the value of the croc skin used to make purses, belts, bags, shoes, and so on started rising, our government began to issue contracts for killing crocs like fishes. Within a few years the crocodiles of this region almost disappeared. They were killed mercilessly. The contractors invented different methods to slaughter them. In the night time, one could approach the crocodiles closely without being noticed. During dark nights, men of the contractors armed with spears, stealthily approached a crocodile with the help of torches and threw spears at it simultaneously. This resulted in incapacitating the creature. The helpless creature was stabbed repeatedly with daggers. The other method used was to fill the belly of a dead animal with quick-lime and seal it to make it waterproof. Quick lime causes an exothermic reaction when mixed with water and intense heat is released. The quick-lime filled belly was placed on a wooden plank and floated in the lake. Some crocodile would come out of water and engulf the dead animal, causing the quick-lime to enter its stomach. Maddened with pain and burning sensation, the crocodile twisted and turned in suffering and finally came and lied down on the shore. The men, who sat observing, attacked the fatigued creature with daggers. Another invented technique was to hide three big hooks in a large chunk of meat and place it on a wooden plank. An iron chain of approximately four feet was attached to the head of the hook. The other end was bolted in the middle of the plank. Crocodiles got attracted to the flesh on the floating plank and gulped it down. When the creature dived down in water, the hooks cut through its body and gripped the throat or mouth. To get rid of the hook and excruciating pain the crocodile tried to go deeper down in water. The more it tried, the more the wooden plank pushed it upwards. It went hither and thither with the plank. When fatigue overpowered, it came out on the shore. Armed men, lying in wait, attacked and killed it. The hard skin on the back of the larger crocodiles was useless and only the skin on the belly was removed. The entire skin of the smaller crocodiles was used. Not just in Udaipur but all over the nation the population of crocodiles started dwindling. Finally, the government had to take stern steps. Their hunting was totally banned, breeding centres started coming up at various places and they were released again in lakes and rivers. Now it faces yet another problem – sustenance. Also, erosion due to the felling of trees and jungles has resulted in filling the bottoms of the lakes and consequently reducing the depths. Some lakes in Udaipur which used to be full year round have started drying in summers. This has resulted in a consistently increasing habitat problem. Zoo bred crocodiles were introduced in Bagdara Lake near Udaipur. They were flourishing there. However, recently, the phosphate content of the lake has gone drastically high due to the surrounding industries. The lake doesn’t overflow and the concentration has been going up every day. The skin of the crocs will start to calcify soon with phosphate deposits and it’ll prove to be very detrimental for the few last crocodiles of Udaipur. Let’s hope that these reptiles, which have survived the age of the dinosaurs, are able to survive the modern man.